Butterscotch and maple aromatics were a great first impression for this coffee. It was full bodied, juicy, and smooth texturally, with a rather balanced acidity to compliment. Notes of peach, mandarin orange, and pineapple were supported by toffee, and light brown sugar in the overall medium intensity sweetness. Baking spices and a lightly nutty complexity added nuance, and each sip lingered sweet with grape skin tannins. 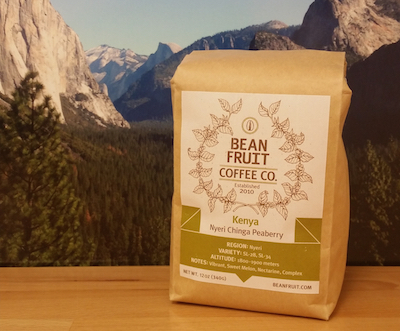 BeanFruit Coffee Company is an award-winning coffee roasting company located in the Jackson, Mississippi metro area. Since 2010, our desire is to provide fresh roasted coffee with a focus on single-origin coffees. We meticulously select the coffee we roast and roast it to perfection to bring out the character of each coffee. Categories: Coffee Ratings. Origins: Kenya. Flavors: Baking Spices, Mandarin Orange, Nutty, Peach, Pineapple, Stone Fruit, and Toffee. Brew Descriptors: Chocolatey, Citrus, and Smooth. Roasters: BeanFruit Coffee Co..